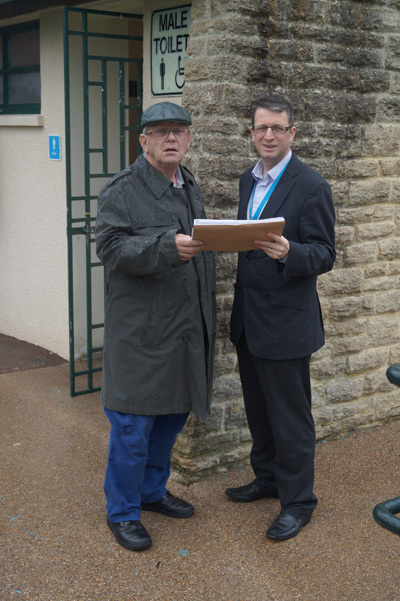 A petition signed by hundreds of Keynsham residents in opposition to changes to the public toilets in the Memorial Park has been handed to B&NES Council leaders. The campaign, organised by local councillors and backed by 675 signatures, is urging the authority to reject plans to reduce the number of cubicles to just one unisex loo and one disabled access loo. The toilets, next to the park cafe, currently have ladies' and men's toilets, with two cubicles for women and one cubicle and a urinal in the gents'. Under the proposals by contractor Healthmatic Ltd there would also be a charge to use the toilets - expected to be around 20p. On Wednesday, June 4, Keynsham councillor Brian Simmons (Cons) handed over the petition to B&NES Cabinet member for neighbourhoods Councillor David Dixon (Lib Dem) at the park cafe. Members of the public commenting on the plans submitted to the council have raised concerns about queues forming for the toilets and worries that some visitors might opt to use land near the site instead of waiting in line or paying a fee. The petition calls for the plans to be revised to allow more toilet capacity. Councillor Simmons (Cons, Keynsham North), said: “We’ve spoken with hundreds of people over the last few weeks about these plans and it’s clear that the majority of residents and park users are deeply opposed to the cut in toilet capacity. “The fact we gained nearly 700 signatures in just a couple of weeks demonstrates the strength of feeling amongst local people. “People are frustrated by the fact that B&NES has refused to listen to our genuine concerns about these changes. Of course modernising the toilets is widely welcomed, but there has to be adequate provision. “There can already be queues at the toilets at busy times, so reducing capacity further to just one unisex cubicle and one disabled toilet simply makes no sense.